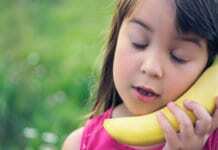 When I was a little girl, I used to lay in the grass and dream up into the sky. My favorite days were when the sky was crystal clear blue and the clouds were soft puffy white. I’d imagine jumping from cloud to cloud, nuzzling myself into them like a feather pillow, and staying there for days. I have always been fascinated by clouds and how they sometimes look thick and plush enough to lay on. How they give the illusion that they could hold you. Comfort you. Catch you. 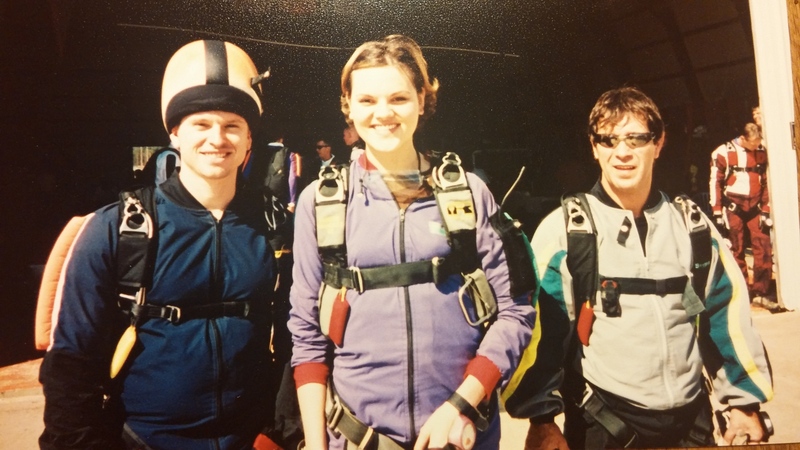 When I was 18, I went skydiving. I’d always wanted to do it because it seemed like the closest I’d ever get to flying and dancing in the clouds. 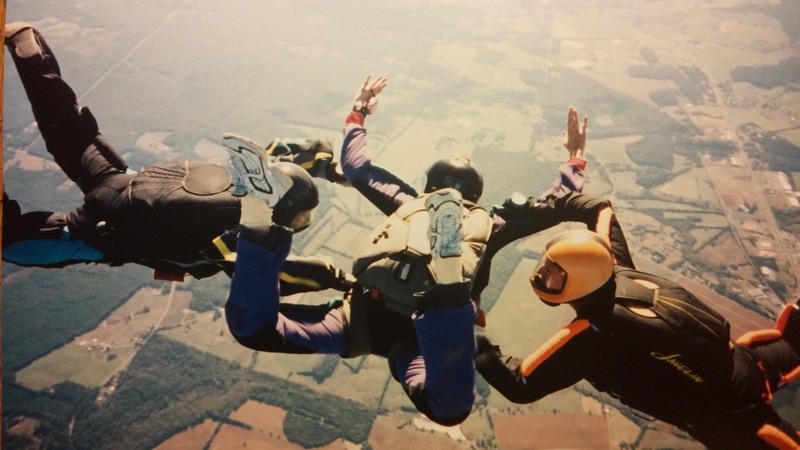 When you first jump out of a plane, you’re falling so hard and so fast you literally can’t breathe. There’s no time to even notice what’s happening because if you want to survive, you have to make sure you get your parachute out at the right altitude, lest you plummet to your death, and nobody wants that. In the frenzy that is falling through the sky at 30,000 feet, I had a bit of a hard time finding my parachute release. 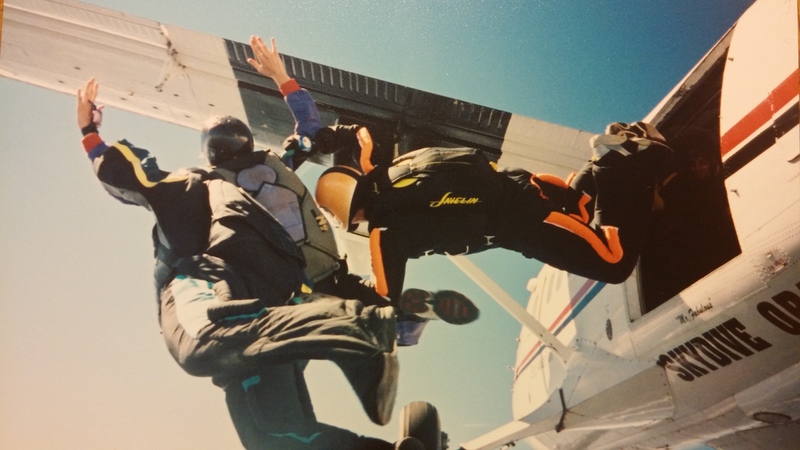 I eventually got too low and another more experienced skydiver flying beside me had to help me pull the lever. When that lever gets pulled and the chute opens up, it feels like you are being ripped out of the sky. In reality, your fall is simply being slowed, but it feels like the hand of God just snatched you up by your shirt collar. After the initial shock of what just occurred wore off, I tried to enjoy the ride. I floated my way through the sky and tried to comprehend what was happening. I looked at the clouds as I flew by them and I realized more than ever the truth and capability of a cloud. I fell right through them. They didn’t slow my fall. I couldn’t feel them as I passed by. Clouds that looked thick and promising were vapor by the time I dropped inside them. I continued to fall and as the ground got closer, the luxury of the decline began to lessen. It became less enjoyable as I realized how fast I was falling and how close I was to the ground. Even the parachute couldn’t keep me from crashing into the earth without some skill. Skill I didn’t quite have. I struggled to pull the toggles down fast enough and though it slowed me some, I still came zooming into the ground at full speed and I landed hard. The ground was not forgiving and it took a moment to stand back up. I shook it off to save my pride, but I was hurt. I didn’t break anything, but my wrist has never been the same. 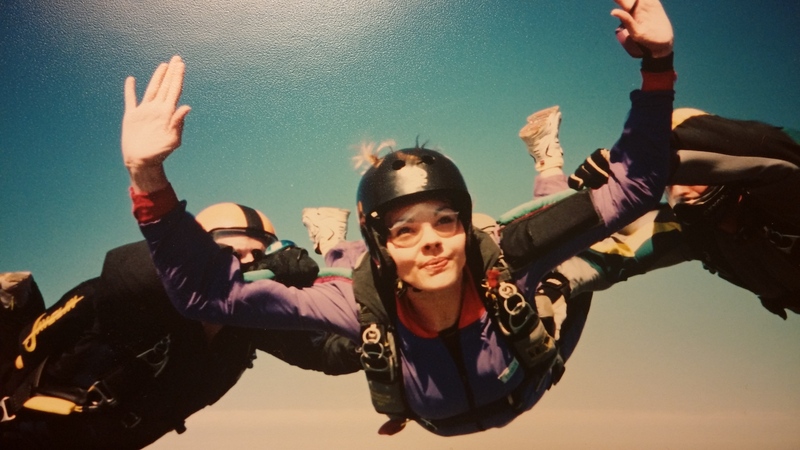 Ending my relationship with my husband has been a lot like my skydiving experience. Like falling through the air and grabbing for the clouds. A year ago, I finally figured out how to pull the parachute, and though it saved my life, it felt like being ripped out of the sky. When I met my husband, I fell in love with an illusion. A dream. I held onto it believing that someday, with enough effort, hope and prayer, that dream would become a tangible reality. For 5 years I fell through the air, grasping at clouds hoping just once, something I could grip would be there. I fell, and as I watched the ground get closer and the clouds flew by, I continued to believe that before I hit the rocky bottom, eventually one of those clouds would catch me. It never worked, and I pummeled my way into the hard, cold ground. There continues to be promises of the cloud somehow morphing into something it simply was never created to be. And it’s painful. At a certain point in this reckless free fall, the dreamer has to wake up and realize they’ll die waiting for the fulfillment of an air-filled promise. No matter how much I wish I could float through the sky landing on clouds, and no matter how much it looks possible from the ground, when I get right up on it, it becomes clear that all I’m seeing is thick air. I have to accept it for what it is. Staying committed to attaining something unattainable, at a certain point, is no longer romantic or Godly or sweet. It’s unhealthy and damaging and toxic. It’s foolish. Over the course of this past year, I have learned to navigate the clouds. I’ve learned that though I’m falling, I have a parachute. I’ve accepted that the clouds cannot catch me and I have to release the dream that they can. At times, they still look promising. They still present an image of stability and brawn. I still sometimes wish I could stop the free fall and dance on the clouds. A piece of my heart still holds out hope that someday, the cloud will be made of something different. That someday, it could catch me. But falling for that illusion will lead to my death, and I have to stop. The truth is, even with a parachute, the landing hurts. It causes damage if you don’t have the skills to come in smooth. Unfortunately, after falling for so long, hoping through clouds, there isn’t much time to learn how to land before the ground meets you where you are. It’s ugly. It’s messy. It’s painful and embarrassing. Pulling the metaphorical parachute on my accelerated free fall of love has been difficult to say the least. But through the fall, I learned a lot. My wrist (and my heart) may always have a twinge of pain in it. But I didn’t die. And I’m grateful. Not only for the fact that I didn’t die, but for the lessons I learned along the way. For the hand of God ripping me out of the sky from the careless fall. For the ability to see through the clouds, and the realization that I have to let them go. Because ultimately, all that’s in my hand is air. 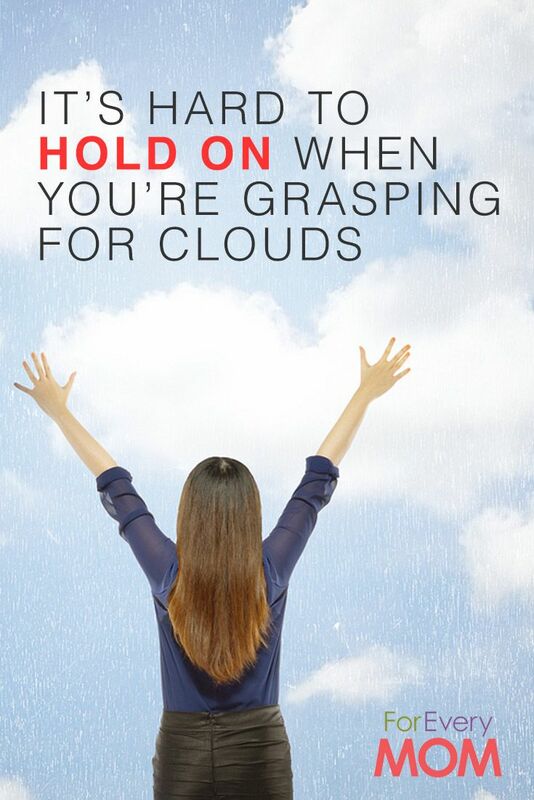 In order to stand on the ground, I have to stop grasping for clouds. Previous articleThis Mom Wins the All-Time Worst Potty Training Story For EVER and EVER, Amen! And…Better Her Than Me!